Most of David Eshelman’s 29 years in the service were spent as an airborne trooper. 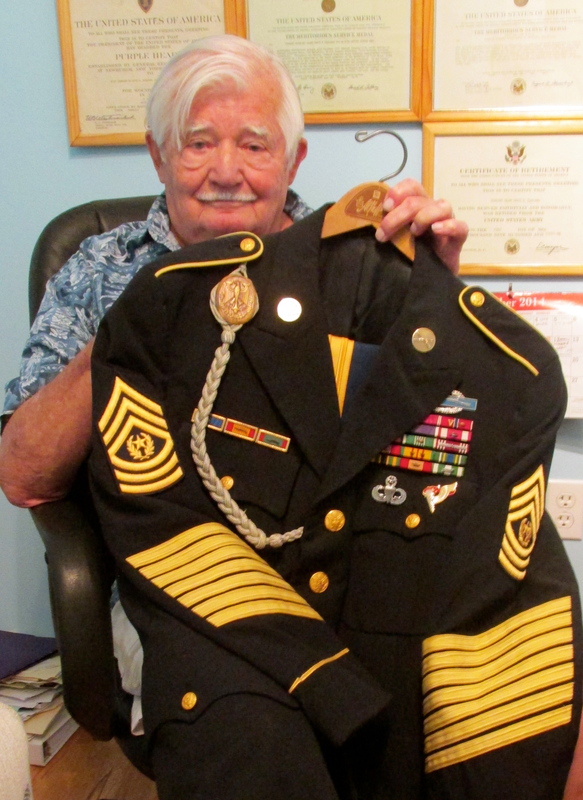 In 1979 he retired a command sergeant major, the highest rank an enlisted man in the U.S Army can achieve. A month after the Korean War started in June 1950 he joined the Army at 17 with his parents’ blessing. He hadn’t graduated from high school. “I’d been in basic training a week at Fort Knox, Ky. and in walked six guys in starched khakis and dark black jump boots,” he recalled almost 65 years later. “I found out they were a recruiting team from the 82nd Airborne. The next day I was on a train to Fort Bragg, N.C. home of the 82nd. “I think my incentive was I could double my $59 monthly pay if I went airborne and jumped out of airplanes. I went to jump school at Fort Bragg not at Fort Benning, Ga.
“I had to weigh 125 pounds and I only weighed 123 pounds to attend jump school. During the physical I filled my pockets with three pounds of rocks, passed and went airborne,” Eshelman said with a grin a lifetime later. During all of the Korean War he and the rest of the 82nd Airborne spent training for war at Fort Bragg. He finally got to Korea in 1956 as a member of the 24th Infantry Division stationed along the Demilitarized Zone that divided North and South. He returned to the 101st Airborne Division at Fort Campbell, Ky. His unit’s first assignment was to help the federal government open Little Rock High School to blacks over the protests of Gov. Orval Faubus. After that Eshelman and the 101st were sent to “Ol’ Miss.” in 1962 again to represent the federal government during the enrollment of James Meredith, the university’s first black student. In April 1968 he was serving as an advisor to the Tennessee National Guard and found himself in Memphis hours after Martin Luther King was assassinated by a lone gunman. His guard unit arrived in full battle dress to quell the riots that were expected. “‘Sir, he’s in the next room,’ I replied. “‘Don’t worry about it. Have him call me.’ He hung up. By this time Eshelman had already served one tour in Vietnam. He went there the first time with the 173rd Airborne Brigade stationed in Okinawa in 1965. They were the first regular Army ground combat unit to go to ‘Nam. They were stationed near Bien Hoa Air Base. In October 1965 Eshelman was selected to become 1st Sergeant of A-Company, 173rd Brigade. He went back to Vietnam on a second tour in 68-69. “I was with the 2nd Battalion, 60th Infantry, 9th Infantry Division in a little place called Tan Tru in the Delta, south of Saigon. Later I served with the 24th Corps, the largest combat team in Vietnam in Phu Bai. My rank was increased to sergeant major. “Capt. 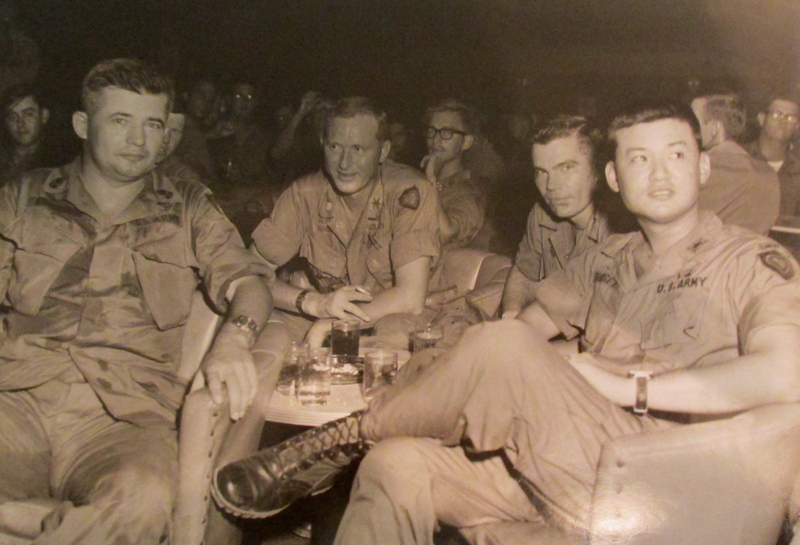 Eric Shinseki, who later became Army Chief of Staff, served in the office next to mine at Phu Bai. He was a great guy who was going places,” Eshelman said. “Most people don’t know he lost a foot to a land mine in Vietnam. “When he was in the field flying in a helicopter he always had a pair of black pajamas rolled up in the back of his pistol belt. I asked him what the pajamas were for. “‘If we get shot down you round eyed guys are on your own,’ he replied. He could put on his black pajamas and pretend to be a Vietcong guerrilla if they crashed in enemy territory because he spoke fluent Vietnamese. Shinseki was at Eshelman’s going away party when the sergeant returned to the States in 1969. He was the general President George W. Bush fired after the general advised the president it would require several hundred thousand troops to fight what the Iraq War. His estimates were correct in the end. Later he was appointed head of the Veteran’s Administration by Presided Barack Obama and more recently he resigned because of the organizational mess at the VA which was not of his making. For the nest two years Eshelman was assigned to an ROTC unit at the University of Connecticut. Then he returned to the 101st Airborne as the command sergeant major of the unit’s Air Defense Vulcan Battalion. This was an anti-aircraft 20 millimeter Gatling gun that fired 3,000 rounds a minute. He spent the next year at Fort Bliss, Texas training to use the Vulcan gun. Then his outfit was reassigned to Fort Campbell, Ky.
Germany was Eshelman’s next assignment. He spent four years there as command sergeant major of a Niki-Hercules Missile operation and loved every minute of this deployment. After returning from his European tour he became the senior advisor for the 36th Airborne Brigade in the Texas National Guard. It was there two years later the little Honda 360 motorcycle he was riding around town was struck by a woman who ran a red light in a car. His injuries forced him to retire from the Army in September 1979. He was 48. In 1998 Eshelman moved to Florida and a couple of years later he suffered three heart attacks in quick succession. He was living in Sun City, south of Tampa, when he met and married Patricia, a retired registered nurse. For the past five months the couple has lived in Jacaranda Trace. He had two children: son Rick, and Deborah who is deceased. This story was first published in the Charlotte Sun newspaper, Port Charlotte, Fla. on Monday, Oct. 6, 2014 and is republished with permission. Click here for his collection in the Library of Congress.